A skiing experience you will remember! LadiesCamps offer a unique skiing experience for you ladies who want to develop your off-piste skiing during an extended week-end. Long enough to relax, enjoy the beautiful mountains, and develop your skiing in some of the world’s best off-piste skiing areas. You get four days of skiing. To be in the right spot at the right moment is the key to good off-piste skiing. We start the Ultimate Ski Tour at the Cointrin airport in Geneva, right at the heart of the Alpes. Depending on weather conditions and snow forecast we hit the road to find the best conditions. Likely spots include the Aosta valley in Italy within the order of ten ski resorts. 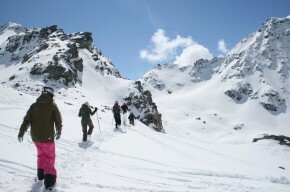 La Grave in France offers anything and everything between steep couloirs to fantastic skiing in the forest. In Switzerland we choose between ski resorts like Zermatt, Grimentz, Ovronnaz, Les Diablerets in the western part of the country and Engelberg, Lenzerhide, Davos, St Moritz in the eastern part of the country. From Geneva we can easily reach literally hundreds of resorts. 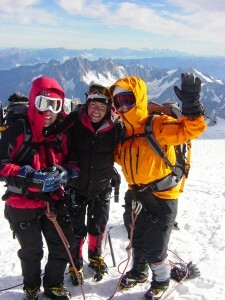 We cooperate with the certified mountain guide Mike Wright and his team. If you don’t have your own safety equipment we will lend you what you need. No matter your level as a skier we help you to develop your freeriding/off-piste skills. 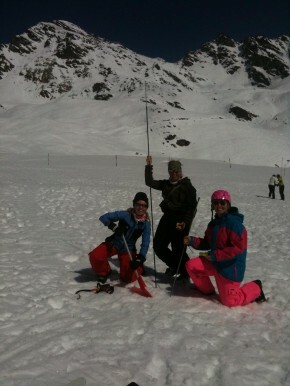 To participate you need to be a rather accomplished skier, comfortably skiing down all slopes, from green to black. You have tried off-piste skiing before. If you are uncertain of you meet the requirements don’t hesitate to contact us. Since our focus is to be on the right spot on the right time accommodation chosen accordingly. We stay in good smaller hotels** or in apartments. Our guides have good local knowledge and seek out nice places to stay. The Ultimate Ski tour starts with a pick-up on Cointrin, the Geneva airport, at 15.00 on Wednesday and ends on the airport on Sunday at 20.00. You book your own connection to the airport. Note that there is a train station at the airport. Note that the travel arrangements to Geneva airport, lunches, dinners, the mandatory insurance, and any heli-skiing is not included. Bring your own skins for the skis if you have them. If you have your own safety equipment you can bring that as well. We will provide you with any items missing. See you at Geneva airport! 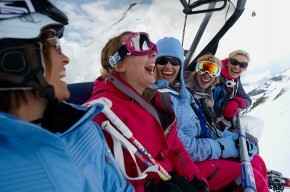 LadiesCamps' ultimate ski tour on a mountain top. We seek out the best rides. 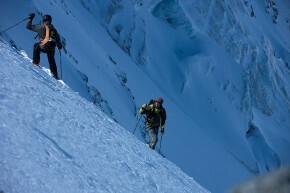 Our experienced guides find the best off-piste. Avalance education on the camp. A Ladies Camp is also a great laugh.